Cost depends on products selected and services performed. 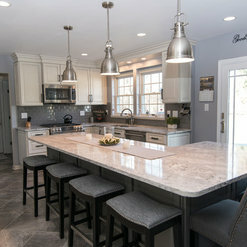 50 Projects for O'Hanlon Kitchens, Inc.
66 Reviews for O'Hanlon Kitchens, Inc.
From start to finish, O'Hanlon Kitchens were outstanding - and the finished product is so lovely - I want to spend all my time in my new kitchen. I highly recommend them - they will work with your schedule, budget and preferences. Excellent! We went to O'Hanlon after the first company we consulted did not like our ideas or incorporate our requests into the kitchen remodel plans. Then, we met with designer Tracy from O'Hanlon. At first meeting, we knew this would be a better experience. She listened and came back with a design and estimate that worked. The project (which included kitchen, laundry room, powder room and adjacent family room) started on time and was completed within 5 weeks. Melanie did a great job of coordinating all the subcontractors and assigning Dustin, a talented craftsman to our project. Both Melanie and Dustin were professional and communicated with us regularly at each phase of construction. Great job !! Thank you for your detailed review of our company! Being a small, local, and family-owned business, our employees and installers have a lot of pride in the work they do for our customers. We are overjoyed that you were happy with the products and service we provided! We love that the plans and hopes for your space came to Fruition! Our experience with O’Hanlon Kitchens, from design to final inspection on our kitchen reno, was highly professional and pleasant. Their quality workmanship and attention to detail are extraordinary. Tracy, our designer, is very creative, receptive to all kinds of ideas, and so easy to work with. Once the design was locked in, the rest of the well-organized team, Melanie (Project Coordinator), Michelle (Customer Support), Dustin and Rob (Installers) completed the project to perfection and on time. Dustin and Rob were particularly good about keeping the area dust free and clean during the demolition and reconstruction. 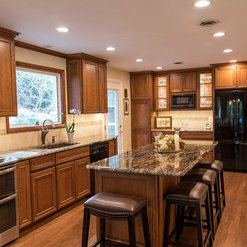 Thanks to the professionals at O’Hanlon, the final result is our dream kitchen. 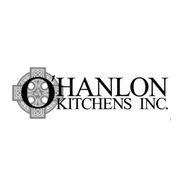 It was a pleasure to work with O’Hanlon Kitchens, and we recommend them highly. Thank you, Trish, for taking the time to review O'Hanlon Kitchens. 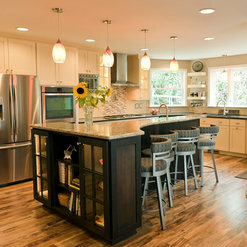 We are so glad that you had such a wonderful experience creating your dream kitchen. We hope you enjoy your new space for years to come! 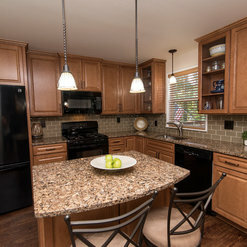 We recently had O'Hanlon do a total remodel on our kitchen and we couldn't have chosen a better company for it! Everyone on the staff was a pleasure to work with, easy going, and reliable. They helped us stay within our budget and built and designed us a kitchen we are going to love forever. (Seriously... It's the only room we hang out in now!) It turned out better than we even could have imagined. Tracy helped us design the kitchen and gave us ideas we hadn't thought about, and wasn't afraid to tell us pitfalls to ideas we had. She also had ideas on how to save money (which we really appreciated) as we went back and forth finalizing the plans. Once under contract Melanie worked with us the whole time, keeping in contact and made sure that everything was going smoothly through the construction process. She was always available to answer any questions we had. Greg and his son Greg Jr were supremely respectful during the installation process. They cleaned up after themselves each day and we quickly learned that we didn't have to ask if they were going to do some such thing or another as they were on top of it all. They were more than happy to show us what they were working on, which we really liked. O'Hanlon also sub-contracted out some of the major construction to Baltic Custom Construction and they were great too. I don't think I could say enough positive things about this whole process. We have already started recommending them to everyone we know! Thank you for your detailed review of our company! Being a small, local, and family-owned business, our employees and installers have a lot of pride in the work they do for our customers. We are overjoyed that you were happy with the products and service we provided! We are thrilled your kitchen has become your new favorite place- Enjoy! Very happy with my kitchen. Cost, duration of work and excellence in construction were all impressive. Justin did a great job. Thank you, Vanessa, for taking the time to review your experience with O'Hanlon Kitchens. We are so glad that you have had a positive experience with every aspect of your remodel. We hope that you enjoy your new kitchen for many years! What a joke. Very slow with providing estimate results and even slower for an itemized list of renovation costs. 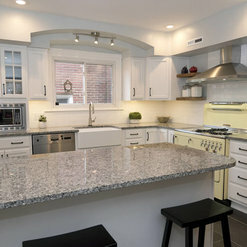 The costs were very unreasonable and far beyond the normal costs associated with a renovation...$45,000 for standard three-wall cabinets...really? Overall cost was projected to be $85,000...appliances and flooring NOT included. Don't waste your time with this company, unless you have money top burn or just won the Mega Lottery...!!! We are sorry to hear that you were unsatisfied with your interactions with our company. We apologize that there was a delay in getting information back to you regarding your estimate. We are usually one of the fastest responding in our industry. As far as the pricing, we do offer multiple lines of cabinetry in different price tiers. We have done jobs from less than $10,000 to over $100,00. The cost of the job depends on the brand of cabinetry chosen, the amount of cabinetry ordered, and the scope of work of other services to be performed. We wish you luck with your project, we know you will find the right company to help you with your project! 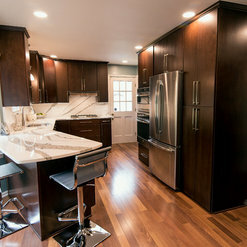 O’Hanlon kitchens did a wonderful job with my remodeling project. They were extremely professional, very conscientious of the work they performed. They were here on time and consistently worked every day until the job was complete. Everyone who comes into my home says it’s the best kitchen they have ever seen. I love my kitchen! Not only is it beautiful, but extremely functional. 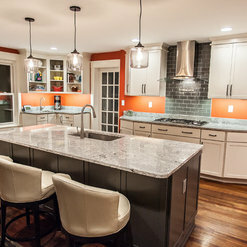 I highly recommend O'Hanlon kitchens to anyone who is considering a kitchen remodel. Thank you for taking the time to review our company! We are so glad you chose O'Hanlon to help you with your project! We hope you enjoy your new space for years to come! I highly recommend O'Hanlon kitchens. We are very pleased with our whole experience and dealings with the company. We hired O'Hanlon to do our kitchen renovation in the Spring of 2018. 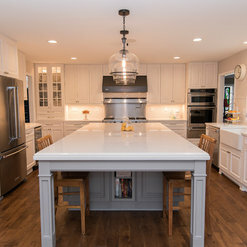 After interviewing 5 other kitchen contractors we decided to go with O'Hanlon because of the overall value they provided and also because of all the positive reviews we read on Houzz. We initially worked with Tracy as our kitchen designer. 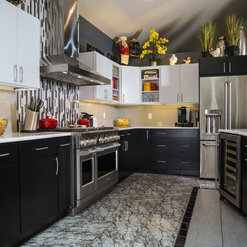 From the beginning she was pleasant and knowledgeable about kitchen design. She was very patient with me and was willing to do several revisions to the design so I can get the dream kitchen I've been wanting within my budget. Greg and his son were the contractors/carpenters who did the actual renovation. They were professional, meticulous in their work and always cleaned up after their work day. Melanie and Michelle were the project managers/liaisons for the job. They were responsible for dealing with the cabinet maker to make sure our kitchen cabinets were in tip top shape. Any cabinets that needed to go back due to incorrect size or damage to the doors etc. they took care of and they always kept me in the loop as to what was going on. 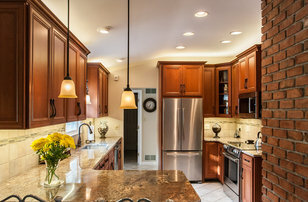 The kitchen reno was completed in the 3 weeks schedule that was agreed upon in the contract. We did have to wait for the side skins for a couple of our cabinets because St. Martin cabinets delivered the wrong size. But I had a fully functioning kitchen within 3 weeks. I am very, very happy with the final result of my kitchen reno! O'Hanlon kitchen did a top notch job! Thank you for taking the time to review O'Hanlon Kitchens! As you have learned, construction is unpredictable. We are committed to staying on target with time frames, as best we can through experience and great relationships with our vendors. We hope you enjoy your new space for years to come! We appreciate you giving us the opportunity to work with you on your project. Let me just start with....we LOVE our new kitchen. Our old galley-style kitchen had all the original cabinets and counters from when the house was built in 1985. Needless to say it was very worn and dated. O'Hanlon brought our kitchen back to life with new everything (except flooring)! Their professionalism is top notch and personalized. Starting with our first meeting with Tracey, their designer, we knew we'd selected the right team for the job. She really listened to our wants and needs for the new design and put it all together beautifully. Greg's workmanship brought Tracey's design to life. His attention to detail and finishing touches enhanced the overall aesthetics which was very important to us. And Melanie, the project manager was great keeping all the progress on track. They finished the job as scheduled! We highly recommend O'Hanlon Kitchens and appreciate all their effort making ours a beautiful part of our home. Thank you, O'Hanlon Kitchens! We thank you so much for your kind words. We all enjoyed working with you on your kitchen project and are very happy you love it! We can't wait to have our photographer take photos so we can share with everyone. I attached a few photos Melanie took when she was out to visit your project. Again, thank you for your review and for allowing us to help with your kitchen project. 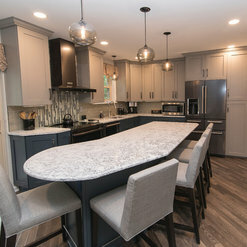 My wife and I were planning for our Kitchen Renovation and looking for high quality, reasonable pricing, product and kitchen layout creativity and knowledge, and of course excellent customer service. I am happy to say that from our first meeting with the designer through the end of the project was a very positive experience. Our designer was a great listener and the plans she prepared for us were exactly what we had envisioned. The installers were extremely knowledgeable, precise with all measurements, courteous, clean and focused on every little detail to ensure that our kitchen was a masterpiece. The project manager shared the schedule with us at the beginning of the project and all happened exactly as mapped out. She managed the details and coordinated deliveries to ensure our project stayed on schedule. 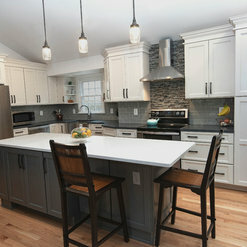 We are very happy with the finished product and would recommend this team to anyone who wants a quality kitchen remodel. Thank you so much for your glowing review. We enjoyed working with you both on your kitchen project and can't wait to have our photographer take pictures! We know your review will help clients in their decision-making process. Tracy, Michelle, and Melanie were wonderful to work with. They were friendly yet professional and they were knowledgeable. If one of them didn’t have an answer they found it and got back to me quickly. They were on top of everything, and were a help when I needed them for some decisions. Greg did a nice job with installation. Thanks so much Jodi. It was truly a pleasure to work with you.. We are excited to hear that you are pleased with your overall service and kitchen project. We hope you enjoy your beautiful new kitchen for years to come. What a great experience!Melanie and Michelle were so fun to work with and I feel like I have made great friends in the process. 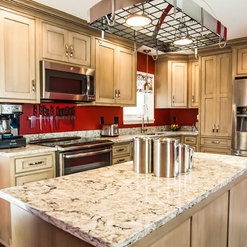 If you are in the market for a new kitchen, I highly recommend O’Hanlon Kitchens in Sparks, MD. Having attended a seminar at the Home Show I was impressed with their presentation and keep their information knowing I was getting ready for a major remodel. I already had a contractor for the construction of the kitchen but purchased my cabinets and countertops from them and my new kitchen is gorgeous. Melanie Sammons worked with my plans and designed the perfect kitchen incorporating many extras on my wish list such as granite countertops, spice rack, roll out pantry drawers, trash pull out etc. Melanie and Michelle arrived at the job site as soon as the cabinets were delivered to correct any issues and liaise with my contractor’s installation team. In addition to the kitchen, I ordered cabinets and quartz countertops for the master and guest bathrooms and they are beautiful. Melanie went above and beyond to make sure the installation was complete. She was always very responsive and made me feel like a truly valuable and special client. Commented: BacksplashScott, for the main backsplash tile we used Mannington-Patchwork-Fresh Linen 6&quot;X6&quot;, the accent tile is Conestoga-Mosaic Slate Medley-Linear. Please let us know if we can be of anymore help. Commented: what are the dimensions of this island?Sorry it took us so long to get back to you. That island is 6.5ft long by 26&quot; wide. Thanks for asking.